Writer and Artist Frank Miller leaves lasting impressions on the characters he is most commonly associated with. Neal Adams took the campiness out of Batman, but Frank took it a step further with The Dark Knight Returns. Batman for the modern age of comics was forged by Frank Miller. Because of Year One and The Dark Knight Returns, further creators pay a certain amount of homage to these exceptional stories. This can be said for Daredevil too. Stories like his run on Daredevil Vol. 1, Born Again and The Man Without Fear flesh out Daredevil’s mythos. It is not inappropriate to say that Daredevil wouldn’t be the Daredevil we know without Miller. Frank was writing and drawing the Daredevil ongoing series while he wrote this story. Frank transformed this character into a gritty, dark, Batman like character. If you wanted to know where the violence in the Daredevil Netflix show came from look no further than anything Frank Miller created for Daredevil. We are told to not live our lives thinking about what ifs. That by doing so we get caught up with what could have been or what should have been. Today is a different kind of day. I am dwelling on a distinct what if. 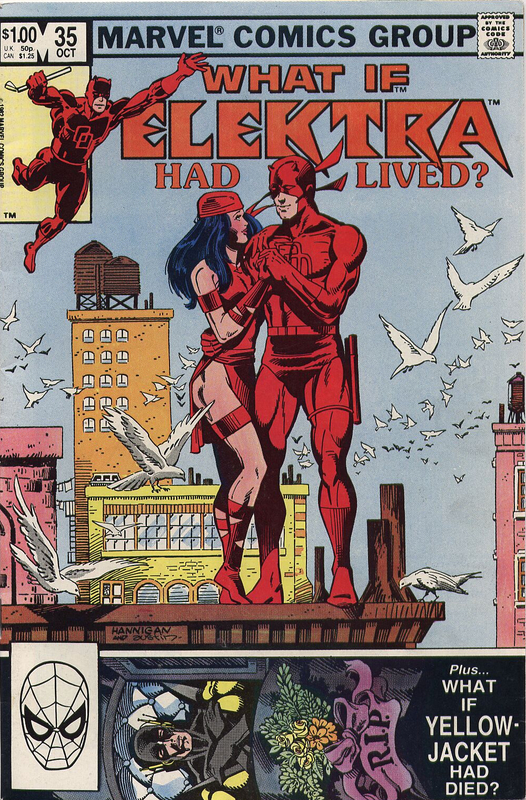 In April of 1982 comic book fans were mourning the loss of a fan favorite character, Elektra. Frank Miller created an endearing love interest for Daredevil, only to be stripped from him. Torn from his heart by the assassin Bullseye. Not long after, 5 months give or take a few days Frank Miller would pen and pencil a Marvel Comics “What If” story entitled “What If Elektra Had Lived”. Terry Austin inked this book. Terry is best known for working with John Byrne on his Superman, Amalgam comics books, OMAC and countless others. Matt Murdock aka Daredevil would be given an introspective look at what his life would be like if Elektra had not been killed. We open to Matt mourning the loss of his love at her grave. Only to be met by a mysterious figure. This man, woman or being furnishes Matt a glimpse of what life he could have had. This alternative reality opens to Elektra pursuing Foggy Nelson as she was hired to assassinate him. Like a fly in a spider’s web, Foggy is eventually caught by Elektra. Elektra realizes that her target is none other than Foggy Nelson, her college boyfriend’s best friend. Foggy is released and makes his way to tell his friend what has happened to him. Matt goes on his round of Hell’s Kitchen after hearing this story of Elektra being back in their lives. That same night Elektra finds herself battling assassins hired by the Kingpin for her insolence. Not killing Foggy Nelson would cost her more than she bargained for…or will it? After dispatching the hitmen, she makes her way to Matt Murdock’s apartment, the man she loved a long time ago. Of course, Matt is welcomed to his surprise to find his once lover waiting for him on his bed. First thing Matt says when he senses her is, “I’m taking you in”. Elektra explains that the Kingpin has a death mark on her and that to bring her to prison would surely lead to her death. She poses him a simple question that isn’t answered so simply, “Do you want me to die, Matt?”. The answer that Matt gave in hindsight seems so absurd. After more than 3 decades of comics between now and this issue I can honestly say Matt Murdock wouldn’t come to this conclusion. He decides to leave his world to run off with Elektra. We can discuss that this ending wasn’t Matt’s doing. That the being giving Daredevil this alternative reality is fabricating what he feels Matt would want out of his life. That if given his first love, at that time his greatest love, back, that he would leave with her and never look return. Since this comic book, Matt has fought crime in many ways, whether it is by revealing who he is, deciding to move locales or even claiming to be the new Kingpin of Hell’s Kitchen. What these attempts at culling crime have in common is his relentlessness and reluctance to back down. Packing it up and leaving just doesn’t sound like Matt Murdock. Like I mentioned in the beginning, this is a what if story. These what if stories that Marvel created were meant to give us images of what the Universe could be like. Not what it is or what it is going to be. These allow creators to take liberties and to allow them to be completely expressive. Not adhering to any continuity. Knowing this we can take a leap of faith that possibly Matt would consider leaving his fight for the streets to join the woman he loves. Frank Miller created this chemistry and therefore killed it in regular continuity. He could be seeking closure in the form of a “What If” story. Closing the Elektra chapter in Daredevil’s life.